Adorbay anti-slip rug grippers,10 pieces of Rug Holders, instantly flattens curled rug corners and grips floor to keep from slipping and sliding across the floor, provides a  FREE & SAFETY walking environment for kids, pets and elder folk. Rugs stay put, and corners won't curl. A really great purchase if you have issues with rugs moving. Easily peel off when need, regularly re-moisten the grippers to stick to the floor like new, truly made for long Service. Environmentally-friendly carpet gripper tap with Renewable sticky gel. Work on Any hard floors with FLAT surface. Will not harm floors as the stick gel is "Residue-free". Our premium quality Floor Protector. Easy to open, clear instructions and it works great! Fix Anything Anywhere you want. ( for outdoors recommended as anti-curling rug pads). Small body with great effect! 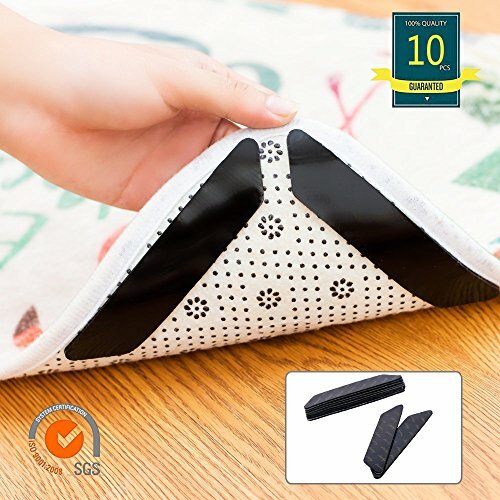 Adorbay anti-slip rug stopper measures by 5.4"x 3.9"x1.2" - less than 1/8" thick, totally Invisible under the carpet underlayments, makes corners edge lay flat and no problem when vacuuming the carpet. Not very recommend outdoor or on top of a carpet using because the gel is sticky only when surface is dry and flat. Keep the ground(floor) and the back of the carpet flat, clean and dry before use. The contact surface is ROUGH✘, with WATER ✘, OIL ✘or DUST ✘ will affect the paste effect. ★【Be Safe, Not Sorry】 The rug slip and slide trouble you? Wondering how to keep rug in place and make corner flat? We provide Adorbay rug rippers. SUPER STICKY double sided carpet grips tape, ultral thin corner grippers with thickness1/8 inch only-Keep wrinkled rugs and mats from tripping guests, stayed flat and fine. Make life saver. ★【Flexible & Widely use】 Stick to any flat surface. Anti Slip, Anti-Skid and Anti Curl as Premium Rug Gripper Tape, ideal alternative to rug pad and other underlayment on hard floorings. You may even stick Anything Anywhere with Adorbay Rug Grippers instead. STICK and Come Off in seconds, without causing marks or damage on the floor. ★【Recyclable Grip Pad】 Reusable,Washable,Removable, Adorbay grippers are made of Renewable Sticky Gel with two different adhesives on each side. One side (towards the rug) is designed to stick (semipermanently, you won't have to separate it from your carpet for cleaning) to the rug, and the over side is a Re-usable Sticky Silicon that grips to the floor but is not permanent. RENEW Grip---wipe with wet cloth or wash as new, after drying, the stickiness will be restore. ★【Easy to use & Grip well】 Work best for Any Type, Any Shape, Any Size rugs and carpets, which grips all types of floors firmly and easily, features like tiny suction pores. OKAY to use on surfaces that are clean, dry, flat, and smooth (NotRecommended for use over carpets). Strong Stickiness without hurting floor, it releases quickly when lifted up, allowing you to easily reposition your rugs. ★【100% Risk Free Purchase】 Our area rug gripper cetified by SGS, it helps to prevent accidental slips and falls. Adorbay is a registered brand in US, we aim to give all our customers a happy shopping experience. If our Carpet Grips did not meet your expectations, please write us a message and simply return it for a full refund or a replacement for free. If you have any questions about this product by Adorbay, contact us by completing and submitting the form below. If you are looking for a specif part number, please include it with your message. Emser Tile F78WOODEU0324SB Woodwork Eugene SBN - Porcelain Tile, 3 x 24"